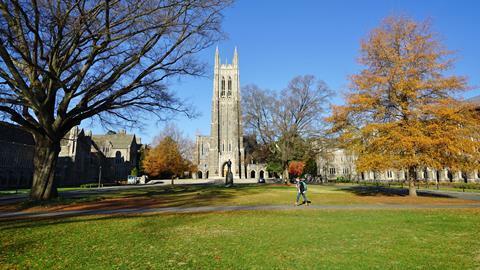 Duke University in the US will pay the government $112.5 million (£97 million) to settle a scientific misconduct lawsuit that alleges it was awarded hundreds of millions of dollars in research grants based on fabricated data. The suit was brought by a former Duke biologist, Joseph Thomas, using a whistleblower law that allows citizens to sue individuals or organisations for fraud on behalf of the government. Thomas alleges that another employee, a technician called Erin Potts-Kant who worked on pulmonary research, falsified data that was used in dozens of grant applications to the National Institutes of Health and Environmental Protection Agency over a seven-year period from 2006–2013. The settlement includes reimbursement for 30 of these grants as well as penalties, and Thomas will receive a sum of at least $33 million. The university sacked Potts-Kant in 2013 for embezzling research funds, but says it did not discover the extent of her misconduct until then. As well as grant applications, falsified data allegedly appears in publications co-authored by Potts-Kant and at least 17 papers have been retracted so far.